management consultant-turned IAS officer Bhupesh Chaudhary who tweeted on Saturday: “Too much formalism in #IAS is not good for fraternity. #SirCulture even among colleagues is against #openness and #innovation in #governance”. He then posted one more message: “Yes, just because I'm 1-2 yr junior in service doesn't mean I'm a child of lesser god #ias #SirCulture”. In his twitter handle, Chaudhary clearly mentions that his views are “purely personal”. But as he posted his views in Twitter, those are very much in public domain for anyone to see or comment on. The 32-year-old Chaudhary hails from Haryana, and he has been allotted the AGMUT cadre. BoI has decided to highlight the comment as “sir”/“madam” culture creates an artificial divide between officers, and at times hinders junior officers from opening up. In a private company, an innovative idea may sometime come from the junior-most executive. But in the government, the strict hierarchy often discourages young officers to put forward their views fearlessly. No wonder, Chaudhary’s views get the support from his contemporaries. 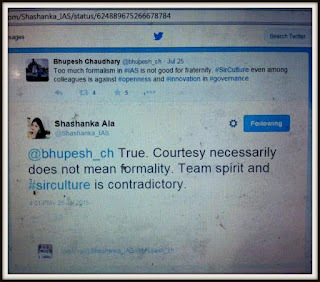 Shashanka Ala, also a 2014 batch IAS from Odisha cadre, argues how “sir culture” and "team spirit" are contradictory in nature. “@bhupesh_ch True. Courtesy necessarily does not mean formality. Team spirit and #sirculture is contradictory”, she says. 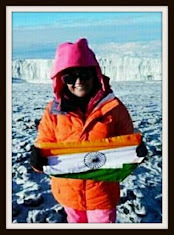 Ala, 26, originally hails from Andhra Pradesh. He is a graduate from IIT-Madras and is also a dancer. In fact, all IAS and other government officers need to address the political executives including MLAs and MPs as “sir”, according the government protocols. No wonder, when 1984 batch IAS-turned Congress leader from Andhra Pradesh Jesudasu Seelam was made the minister of state for finance in June 2013 during UPA-II, his eight year senior in service and the then finance secretary RS Gujral of 1976 batch, had no option but to address Seelam with a prefix: “sir”. Sometime, issues crop up when an IAS officer reaches a higher position because of fast-tracked promotion whereas a senior officer belonging to Group “A” service turns junior in hierarchy. But there are examples when “sir culture” was actually junked. The classic example is former CBDT chairman and 1973 batch IRS officer Sudhir Chandra calling the then revenue secretary and 1975 batch IAS Sunil Mitra by name. Chairman of Central Board of Direct Taxes (CBDT) gets a rank of a special secretary, a position one notch lower than that of the revenue secretary, though both draw the same salary and perks. The same guys and girls would like their seniors of other services to call them Sir/Madam. This is hypocricy! We should get rid off with this culture not just in IAS but entire govt service..